BOOK YOUR SUMMER VACATION NOW! Bay Harbor is a World Class Resort perfect for a Family Vacation, Golf, Romantic Getaway or just relaxing by the pool. Water view, close to downtown Petoskey and World Class Golf Courses , Bike & Hiking Trails & more! 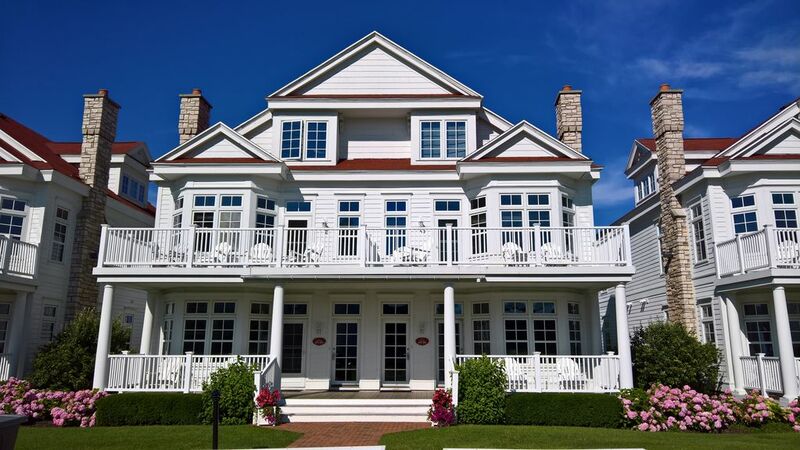 This Bay Harbor - Lakeside Cottage is adjacent to the Marriott Inn at Bay Harbor and features stunning views of Lake Michigan & Little Traverse Bay! Luxury condo sleeps 4-6 comfortably, featuring 2 bedrooms each with flat screen TV's, 2 full baths, full kitchen, eating area, living room with flat screen TV & fireplace, and a generous porch with summer sunset views of the water. Short walk to town of Bay Harbor and Marina district. The Inn at Bay Harbor offers fine dining, casual dining, European Spa, beach, seasonal outdoor pool / hot tub and tiki bar, nightly summer campfires at the waters edge. Lakeside Cottage guests have full access to the Inn at Bay Harbor amenities. - Shuttle available upon request to Petoskey Gaslight District, Bay Harbor Golf Club, Crooked Tree Golf Club, Odawa Casino. Downtown Petoskey is 10 minutes away with lots of shops and restaurants to explore. Harbor Springs (25 minutes away), Charlevoix (20 minutes away) and Boyne City (25 minutes away) all with that small town northern Michigan charm. Special access to the spectacular Bay Harbor Golf Club. Easy access to the Little Traverse Wheelway Trail; 26 miles of biking, walking, snowshoeing, cross country skiing that stretches from Charlevoix to Harbor Springs. Explore several state parks in the area: Petoskey State Park, Young State Park, Burt Lake State Park and Wilderness State Park are all within close driving distance. Mackinaw City and the Mackinaw Island ferry is less than 1 hour away. Boyne Mountain Ski Resort (20 minutes away). Scenic M-119 drive starts in just north of Petoskey and goes through Harbor Springs, through the Tunnel of Trees, Good Hart and Cross Village. Treat yourself to a stunning setting and memorable vacation by staying at this beautiful lakeside condo. When you're ready to reward yourself with northern Michigan living at its best, Bay Harbor is the destination of choice. Located on 5 miles of Lake Michigan shoreline between Petoskey and Charlevoix. Bay Harbor resort is the perfect spot to enjoy vacationing in Michigan. Email or call today for availability. Timely response guaranteed. I enjoyed going to Northern Michigan growing up and I wanted my children to have the same experiences I did. I have been taking my children up north since 1992 and bought a condo in 1994. This a great area to enjoy the best that Northern Michigan has to offer. Close to Lake Michigan, ski slopes, golf courses, restaurants, towns of Petoskey, Harbor Springs,Charlevoix and Boyne City. Wide variety of activities in the area. Sking at Boyne Highlands / Nubs Nob / Boyne Mountain 25-30 minutes away. Lots of shopping in close by Petoskey, Charlevoix, Harbor Springs and Boyne City. Nice selection of restarurants for casual and fine dining. Over 20 world class golf courses in the area. Nearby State Park with sand dunes, beach and hiking and walking trails. Enjoy wonderful sunsets over Little Traverse Bay from the Cottage porch. Enjoy a bonfire with smores everynight during the Summer. Great spot for a family vacation or romantic getaway. Walk to Bay Harbor shopping area. 10 minutes to downtown Petoskey. Pool, Spa, Exercise area, Yoga classes, Bike / Jogging trail. Golf, Skiing, Snowboarding, Sledding nearby. Nice view of Lake Michigan and Little Traverse Bay from front windows / porch. 150' from the waters edge. Access to fitness room at the Inn at Bay Harbor next door. Flat screen TV's in Living room and both bedrooms. Canoe rentals are available in the area. Bicycles are available at the Inn at Bay Harbor next door. Covered porch with 2 chairs. Nice view of the Little Traverse Bay and sunsets. Several ski & snowboard resorts in the area. Many world class golf courses in the area. Covered porch with furniture and view of water and summer sunset. Roomy, clean and comfortable. We stayed for my son's wrestling tournament which is a long day. Was nice to be able to spread out and relax. We had a great experience staying in this cottage! Perfect location and enough space for our family to relax and enjoy up north!! Beautiful setting. Great place to stay. Wonderful people. Would definitely stay again. Property was as it was described. Clean, comfortable and good location. Check in was easy. The perfect “home base” for the weekend! What a wonderful little cottage right on the lake! We were in town for a wedding at the Bay Harbor Yacht Club. We originally reserved a room at the Inn but then my parents decided to join us and we needed something larger. We were so fortunate to find this place! It offered all of the amenities of a hotel (linens, towels, toiletries all provided) along with an equipped kitchen (including Keurig, toaster, dishes, dishwasher, basic pots & pans, dish soap & sponge) and a perfect little living area with couches and a 4-person dining table. We enjoyed some great meals in Petoskey, just a short drive away. We also had a wonderful brunch at the Sagamore Room at the Inn which was right next door. We also did a few carry out lunches at the dining room in the cottage. The place was clean and well appointed. Of course there’s some wear and tear on the furniture but we’ve rented many homes over the years and it was normal wear that we would have expected anywhere. We would absolutely return to this cottage if our travels bring us back to Bay Harbor in the future! Comfortable accommodations and a beautiful location! The cottage was very comfortable and appointed with everything we needed. It was clean and in good working order. A question we had about the DVR was responded to from the owner within 30 minutes! (the owner also replied to my questions before and after we booked his place in a very timely manner). The location is perfect for a relaxing stay. It was a bonus to be able to use the amenities offered by the Inn next door. All the staff were very friendly and helpful. Will definitely return on any future trips to Northern Michigan! Thanks John! Quaint shpping areas in nearby Petoskey, Harbor Springs, Charlevoix and Boyne City. Plenty of nice restaurants in the area. Bay Harbor Golf Club and Crooked Tree Golf Course within 5-10 minutes drive. In addition, there are 20 golf courses within 30 minutes drive. Mackinac Island is a nice day trip. Odawa Casino is nearby. Cleaning fee included in quoted rate. Rates subject to change until confirmed. Additional fees and taxes: 10% Resort fee, 5% local lodging assessment fee & 6% sales tax to be confirmed at time of booking.